This genus presently contains two species. Figure. Walvisteuthis cf. youngorum, ROV video clips, 900 m depth. Note the characteristic fins and vertical, stationary orientation (NOAA OKEANOS EXPLORER Program). The video can be seen here. 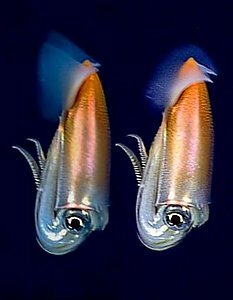 Walvisteuthis species are small, muscular squids that appear to be common but are rarely captured by trawls. The maximum adult size recorded is a female of ML 150 mm (W. rancureli), and males have been observed to mature at ML ~80 mm. This genus is easily recognized by its short, broad shape and oval fins. The type locality of the type species, W. virilis the temperate eastern South Atlantic, but additional Walvisteuthis specimens are known from the tropical North and South Pacific and from the tropical and south temperate Atlantic. Separation of species is difficult and there is some indication that more than the four presently recognized species may exist (Bolstad, 2010). oval fins, not drawn-out posteriorly (unique character within family). elongate-rhombic shaped vanes and short, blunt rostrum oriented perpendicular to tip of gladius (unique character within family). gladius visible beneath skin in dorsal midline. Dorsal protective membranes of arms II and III greatly enlarged (ca. 2X) relative to their ventral protective membranes, and with long, well-defined trabeculae. A few marginal suckers present in subadults. 3 primary occipital folds; large occipital membrane from fold 3 extends dorsally and curves to join occipital crest without forming a distinct fourth fold. Olfactory organ lies at posterior end of fold no. 2.No secondary occipital folds present. 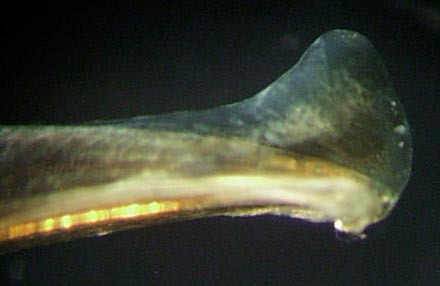 The dorsal ridge of the gladius is readily visible dorsally on an intact squid. Figure. Dorsal view of the holotype of Walvisteuthis rancureli showing the muscles of the mantle to not join one another in the midline but fuse to the gladius (via the shell sac) making the gladius visible through the dorsal integument (when chromatophores are contracted). Photograph by R. Young. Oval with large anterior lobes; not drawn-out posteriorly; apical fin-angle approximately 180°. Figure. 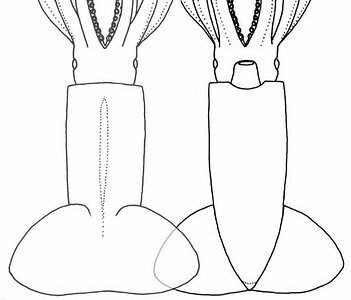 Dorsal and ventral views of two Walvisteuthis rancureli from different localities to show the shape of the fins. Left - Eastern Indian Ocean, female, 105 mm ML). Drawing from Bolstad, 2010. Right - Off New Caledonia, female, 87 mm ML. Drawing from Rancurel, 1970. Short, blunt rostrum directed perpendicular to posterior end of gladius. Gladius with elongate-rhombic shaped vanes; vanes with a sharp lateral angle. Figure. 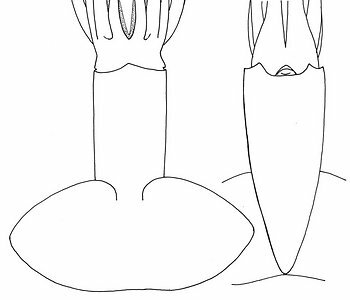 Left - Lateral view (top) and dorsal view (bottom) of the gladius of Walvisteuthis rancureli. (off New Caledonia, 87 mm ML), with an enlarged insert of the gladius rostrum and conus. Drawings from Rancurel, 1970. Right - Side view of the posterior end of the gladius of W. youngorum (Hawaii, 37 mm M) showing the rostrum and small conus. Photograph by R. Young. The identification of W. virilis is a problem since it is only known from two mature and, probably, degenerating males. Therefore, this type species of the genus may remain in limbo until subadult specimens are found from the type locality (near the Walvis Ridge in the Southeast Atlalntic) that are either distinctly different, from the other known species, or not. If the latter, one of the known species will become a junior synonym. 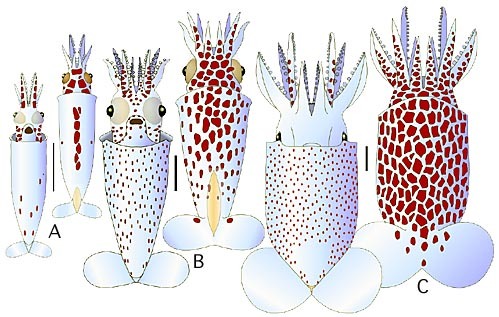 Walvisteuthis rancureli and W. youngorum were originally placed in a new genus, Callimachus, by Bolstad (2010) in her review of the Onychoteuthidae. She was skeptical that the peculiar Walvisteuthis virilis that had originally been placed in its own family, was an onychoteuthid. The latter had some very peculiar features and was only known from two mature males. Vecchione et al. (2015) in their description of Walvisteuthis jeremiahi, reviewed the position of the genus in light of new data and concluded that the peculiar features of W. virilis were due to morphological changes related to maturity and placed Callimachus as a junior synonym of Walvisteuthis. Paralarvae of Walvisteuthis are known as small as 1.9 mm ML. The smallest paralarvae are extremely slender with a mantle width about 25% of the ML. Between this size and about 4-5 mm ML (Fig. A) they are easily recognized by their slender appearance and a distinctive elongate patch of large chromatophores along the dorsal midline. The eyes are dorsoventrally elongate and strongly bulge from the head. Club suckers are in two series, large (about the same size as the arm suckers) and prominent. At roughly 4-5 mm ML (Fig. B) the paralarvae begin a strong morphological change. They start to become relative broad, the eyes become hemispherical and the fins become much more prominent. At 7 mm (Fig. C) the squid is very broad for its length. Chromatophores are small and scattered but larger on the dorsal surfaces than ventral surfaces. On the ventral surface of the head the chromatophores are deep within the tissue and not readily visible in preserved specimens. By 12 mm ML the V-shaped funnel groove and the distinctive rostrum are present and hooks are beginning to form in the medial-ventral series on the club. Figure. Ventral and dorsal views of growth stages of paralarvae of Walvisteuthis youngorum., Hawaii. A - Small, slender-stage paralarva, 2.4 mm ML. B - Paralarva in transition between slender and squat-body forms, 4.5 mm ML. C - Squat-stage paralarva, 7.0 mm ML. The scale bar is 1 mm. Drawings by R. Young. These squids are found world-wide in tropical to temperate seas. Bolstad, K.S.R. 2010. Systematics of the Onychoteuthidae Gray, 1847 (Cephalopoda: Oegopsida). Zootaxa, 9626: 186 pp. Nesis, K.N., and I.V. Nikitina. 1986. 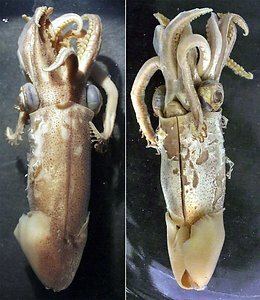 A New Family of Abyssal Squids (Cephalopoda, Oegopsida) from the South-eastern Atlantic. Zoologichesky Zhurnal, 65(1):47-54. Rancurel, P. 1970. Les contenus stomacaux d’Alepisaurus ferox dans le Sud-ouest Pacifique (cephalopodes). Cah. O.R.S.T.O.M., ser. Oceanogr., 8: 3-87. Page: Tree of Life Walvisteuthis Nesis & Nikitina 1986. Stubby hooksquid. Authored by K.S.R. Bolstad, Richard E. Young, and Michael Vecchione. The TEXT of this page is licensed under the Creative Commons Attribution License - Version 3.0. Note that images and other media featured on this page are each governed by their own license, and they may or may not be available for reuse. Click on an image or a media link to access the media data window, which provides the relevant licensing information. For the general terms and conditions of ToL material reuse and redistribution, please see the Tree of Life Copyright Policies.